When I was introduced to cross-country skiing as an adult (what child from the upper Midwest hasn’t tried it at least once in middle school? ), I had already forsaken snow sports. The reasons weren’t because I didn’t love winter or I had an aversion to carving turns in fresh powder. Forgive my condescending attitude, but mostly it was because I loathed being trapped with the hordes of people common to ski resorts, herded along the lift lines like cattle, and then chauffeured up the mountain with the rest of the weekend warriors. The resort experience was so incongruous with who I was and how I lived my life that I just stopped buying an annual pass and instead focused on other activities. Then the California drought of 2011-2015 occurred (i.e. no snow at Lake Tahoe), which only served to reaffirm my choice to abstain from snow sports beyond the occasional snowshoe excursion. The problem, however, was that I genuinely missed playing in the snow and felt at odds with living at Lake Tahoe because I wasn’t fully embracing the mountain lifestyle. Life has a way of surprising us when we’re not paying attention, so I found it interesting that I wound up working at a cross-country ski center in north Lake Tahoe during the last drought winter. This wasn’t by design, but I kept an open mind and quickly discovered that cross-country skiing was the answer to my dilemma. The independence and autonomy inherent with cross-country skiing resonated with me, and the fact that it’s an endurance rather than gravity-based sport sealed the deal. That winter’s snowpack was so low that I only managed to ski about a dozen times, but that was all it took for me to catch the fever. By November of the second season I was ready to go, and nature did not disappoint. 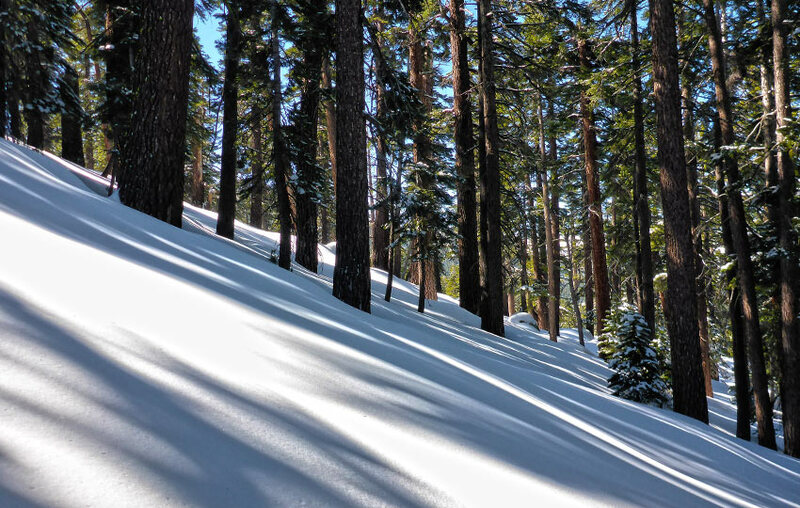 Lake Tahoe received an extraordinarily normal amount of snowfall which enabled the cross-country ski center to remain open every day from Thanksgiving to mid-April. The storms seemed to hit like clockwork, but the snow never accumulated more than what snow removal operations could handle. Between skiing at the center and in the backcountry near my home, I logged 60 days on cross-country skis. For a seasoned ski bum this is a drop in the bucket, but for me it was a revelation. And what I loved even more than having access to great skiing, was the access I had to endless learning opportunities. There’s a lot of support at my job for becoming a better cross-country skier. Another pleasant surprise of immersing myself into the world of cross-country skiing is that I’ve begun to see it as something more than just a sport or recreational pastime. Cross-country skiing has become for me the language of winter exploration. And as with any language, the more fluent you are at speaking and understanding it, the further you can travel (figuratively and physically). Near the end of that second season of cross-country skiing, I decided to test my mettle with a “final exam” that involved completing an overnight cross-country ski tour. Again, to the seasoned skier this is kids’ play. But it was new to me, and I wanted to see how fluent I had become in my study of cross-country skiing. On March 30, 2016, I was dropped off by a friend at the beginning of Forest Service Road 051 (7,425 feet) just down the hill from Luther Pass. The day was overcast with intermittent snow showers, but because I would be skiing uphill the entire day I was not concerned about getting too cold. Since it was late in the season the snowpack was bountiful, but generally stable. My plan was to ski the 3.5 miles up FS 051 to the trailhead (that will ultimately take you to Freel Peak), ski the mile to Armstrong Pass, link up with the Tahoe Rim Trail, then travel a few miles south eventually finding my way to Thompson Peak (9,340 feet) for the night. The following morning I would leave Thompson Peak, reconnect with the Tahoe Rim Trail, then roughly follow it down to the west end of Luther Pass where I would be picked up by another friend. Although I planned the trip only a couple of days prior to my departure and was still new to cross-country skiing, I was familiar with the area in which I’d be traveling, in great physical condition, and was confident enough in my technique to negotiate low angle terrain (i.e. I would choose specific lines that were commensurate with my skiing abilities). Other than the fact that I technically did not stay on top of Thompson Peak (I stopped just north of it), everything basically went according to plan. I packed enough food and clothes. I became hot and tired while skiing uphill and cold when I either stopped or the wind picked up. I took lots of pictures. I captured some video. I did a little journaling before going to bed. I fell on a couple of occasions. I took my skis off completely at other times in order to hike down some of the steeper sections that I wasn’t comfortable skiing. My sleep was less than ideal, but I witnessed both an extraordinary sunset and sunrise. Although I fumbled around both days trying to locate exactly were the Tahoe Rim Trail was, I ultimately hit all of my checkpoints and never felt lost for more than a few minutes at a time (everything does look a lot different covered with snow). I don’t mean to sound as if I didn’t enjoy myself or that the trip was all business. On the contrary, I was quite pleased with the fact that the most remarkable thing about the trip was that it was remarkably unremarkable. 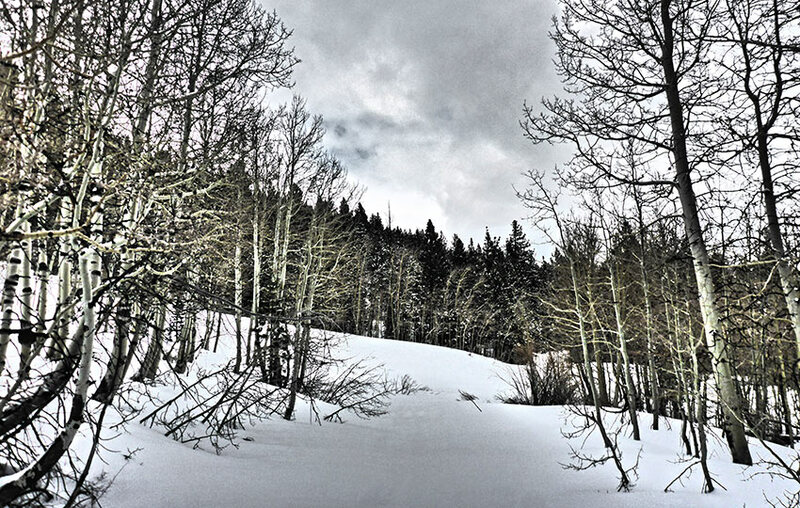 But then again, that’s the most important goal of venturing into the backcountry – to return home safely! And for this first experience, especially since I was alone which is generally never recommended, my safety was priority number one. So, even though I may have paid a little more attention to my posture, technique, and how my skis interacted with the snow and terrain, the bottom line is that I had the opportunity to spend 24 hours exploring Tahoe’s backcountry all to myself in pristine winter conditions. And even though I would classify my grade as passing with regard to this experience, it illustrated so many things that I needed to study and work on before I could truly call myself fluent in the language of cross-country skiing. Here is a short video featuring some panoramic imagery from the ski tour, as well as some brief commentary by yours truly. This video features 40+ photos from this trip and features me narrating the multimedia project using this article as the basis. Day 1. Click on the map to enlarge it for better viewing and printing. This map is only for reference and shows the general route for cross-country skiing from Forest Service Road 051 near the east side of Luther Pass up to Thompson Peak. Your trip may look slightly different than mine based on your specific route selection. You don’t necessarily have to stay within the lines when traveling over snow! Always carry a traditional topographic map and compass when traveling in the backcountry. Day 2. Click on the map to enlarge it for better viewing and printing. This map is only for reference and shows the general route for cross-country skiing from Thompson Peak over to the west side of Luther Pass. Here’s a map to assist you in finding FS 051 (aka Willow Creek Road).